George Greenough "2005 Surf Culture & 2007 Surf Pioneer"
Despite the fact that he hasn’t stood on a surfboard since 1961, George Greenough may be one of the most influential visionaries in modern surfing. Consider these examples: he is considered the inspiration for no less than the modern shortboard revolution, in-the-tube water photography and cinematography, and the modern high-aspect (wide base, narrow tip, deep rake) surfboard fin. Born (1941) in Santa Barbara, his father was heir to a railroad fortune and he was a descendent of noted American sculptor Horatio Greenough. Raised in an eclectic Montecito mansion (his infamous disdain for wearing shoes may have been nurtured during this time), open heart surgery as a pre-teen may have contributed to his position as an outsider among his peer group and turned his attention elsewhere—mainly the ocean. During the 1950s he cut his teeth surfing Santa Barbara’s pristine pointbreaks, including Hollister Ranch (the Hollister’s were family friends). But by the mid 1960s Greenough had spurned traditional surfboard designs, preferring inflatable mat-riding and home-made kneeboard “spoons,” specifically a revolutionary board he called “Velo.” Greenough took Velo and his tuna tail fin-inspired fin to Australia in 1965 and blew minds with his radical direction changes and gouging cutbacks. Combined with Aussie shaper Bob McTavish’s new vee-bottom designs and Nat Young’s “involved” surfing, Greenough helped spark the shortboard revolution of the late 1960s. At the same time he was experimenting with seminal in-the-tube photography and cinematography in the roping pointbreaks near Byron Bay, Australia. His groundbreaking film The Innermost Limits of Pure Fun (1970), shot with camera rigs mounted to the nose of his board or strapped on his back, revealed Greenough’s magnificent obsession with the textures and foils of a tubing wave. Forever beloved as surfing’s eccentric genius, he spent three decades splitting his time between Montecito and Byron Bay, filming, surfing and creating. He now resides in Byron Bay, NSW, Australia. Some folks see things through a different light. George Greenough’s love for the ocean and wave riding proved anything goes, as long as you believe in it. Greenough was born in 1941 in Santa Barbara, California. A descendent of famed American sculptor Horatio Greenough, he grew up in a large Spanish villa in Montecito and walked the road less traveled nearly from the start – often without shoes. His attraction to the ocean potentially spawned from being cast as a recluse from his peer group after open-heart surgery at age 10. Thanks to the abundance of quality pointbreaks in Santa Barbara’s vicinity, Greenough developed a keen knack for surfing during the 1950’s before his tastes for innovation led him to other forms of wave riding, namely kneeboarding and mat-riding. An eccentric little bloke at 5’9”, Greenough continued to fuel the sport’s progression by experimenting and developing with newfangled fin templates and spooned out decks for his kneeboards. The sharp gouges and rapid directional changes his innovations allowed were soon recognized by notable Australian surfers Nat Young and Bob McTavish. 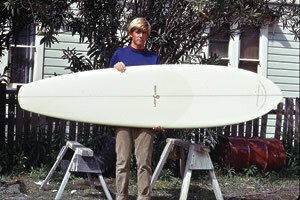 Young went on the win the 1966 World Surfing Championships on one of Greenough’s fins, while McTavish developed a vee-shaped surfboard bottom, aimed at replicating the turning ability of Greenough’s kneeboards – which in turn sparked the shortboard revolution. Aside from surfboard physics, Greenough dabbled in filmmaking and photography and, as one would suspect, started using cutting-edge techniques to captivate his audiences. His in-the-tube angles in photographs and, more notably, cinematography, along with cameras mounted on the nose of board (and even his back!) brought a never-before-seen view of a barreling wave. His earth-shattering film The Innermost Limits of Pure Fun (1970) allowed those who’ve never experienced the joy of tube riding to practically be in the moment all surfers dream of. 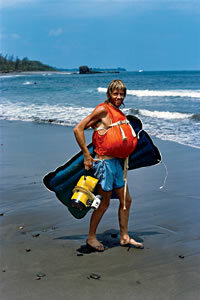 George with his flexible fiberglass spoon kneeboards, was drawing lines that inspired a design revolution. George is already inducted into the Surfing Walk of Fame in the category of Surf Culture in 2005 for his incredible camera work and filmmaking. He also had a huge influence on surfboard design, and is pictured here in Australia’s Byron Bay with a design in the early ’70s of the leading surfboard label, San Juan, where amongst others, Surfing Walk of Fame inductee Nat Young, were testing boards from his influence in the perfect point waves of the north coast of New South Wales. Despite all his innovative shapes and designs, Greenough continued to ride a mat (it was his first choice for wave riding) and his disdain for footwear continued for months on end. He settled in Byron Bay, Australia, unmarried and continued to surf, think, and make stellar films. Rock band Pink Floyd was so enamored with The Innermost Limits of Pure Fun that they donated their music to his next work, Echoes (1972), a film delving deeper in to the sights and sounds of breaking waves. Greenough carried on by working on a host of larger surf films and TV movies. He currently lives in Byron Bay.